Need Help using your Magento theme with WordPress? Here at Cadence Labs, we’ve gotten pretty good at integrating these 2 systems. For help using your Magento theme with WordPress, Contact Us or call (719) 286-0751 to have a real person contact you now. how we can show on magento content from WordPress? Posts on homepage …. with fishpig we can and with James Kemp’s plugin we can’t. It allows you to use shortcodes to insert category listings, products, layout blocks, and static blocks in your WordPress editor. Nice post. I Googled this to death and this one of the complete posts. Can I ask how you handled the issue with script conflicts. Notably when brining the Magento head into WordPress, you end up with multiple jQuery’s being loaded and most likely different versions? So ideally you don’t end up with different version of jQuery – if at all possible, try to use just one library on the wordpress pages (if you’re including Magento’s js via a block, you can remove jquery via a layout handle, otherwise just ignore the jquery line). Also, any jquery that’s being used on the Magento side of things ought to have called jQuery.noConflict() (because $ conflicts with prototype). Are you integrating any Magento 2.0 sites? I assume the above article is integrating Magento 1.9ish. And it appears that the wmi site has been crashed or unavailable for a while. Once the plugin is built, the process should essentially be the same. Magento 2 still supports blocks to encapsulate view logic / rendering. Yes Magento and WordPress have to be installed in different directories for this solution to work. 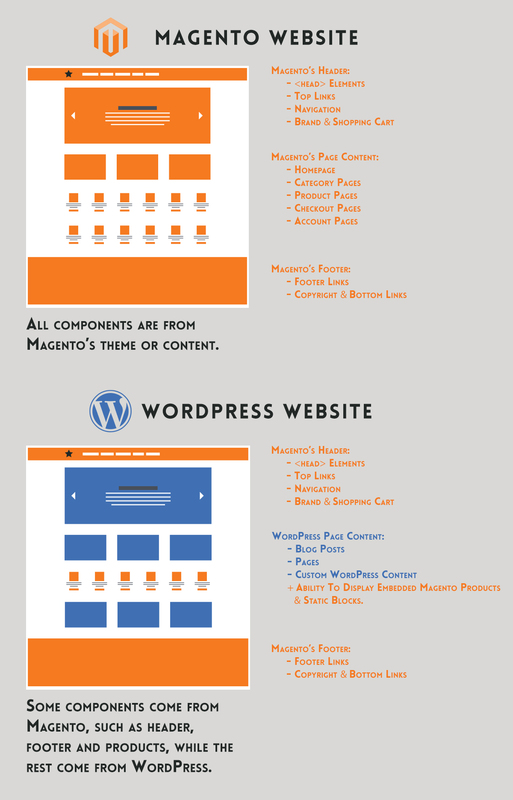 We have been able to do this in either order, so either Magento can be the root or WordPress can be the root. Divi’s builder continues to work inside of the Magento based header and footer. So while the settings for the header and footer in Divi have no effect all of the other features can still be used. Gillian that is awesome. Thank you for the diagram also. That was very helpful. Seems like a little finesse to get it worked out but worth the troubles. The WMI extension site links are foobared thanks to that ‘GeNErAL’ idiot. However, with some persistence I was able to find the content. Still works well with latest Magento 1.9.x version and WP 4.7.5 with Divi version 3.0.47.